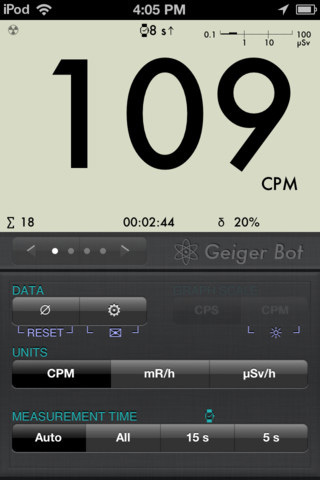 Geiger Bot is a companion app for Geiger counters, providing you with a toolkit for recording, mapping, analyzing, and sharing Geiger counter data. Whether you need a numeric display for an old analog counter, mapping, graphing and extensive logging for even a digital counter, or online automated data sharing via Cosm(Pachube), Geiger Bot can be of use. Geiger Bot just works. As soon as you start up the app, Geiger Bot will get to work without any configuration necessary in most cases. 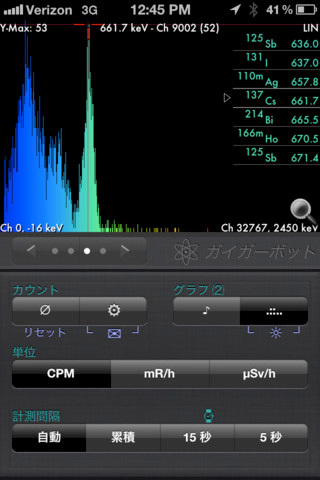 This is done using adaptive signal processing and your device's microphone input. Geiger Bot also supports a direct line-in connection via the headset jack for superior results. Geiger Bot now supports scintillation counters and gamma spectroscopy with isotope ID lists (RIID) ; it is similar in concept to the Windows programs PRA and FitzPeaks. For more advanced users, Geiger Bot allows you to assume direct control of the audio engine parameters for signal processing. There is a console with detailed status messages to assist in troubleshooting. You can configure an offset count for your tube, the conversion factor, measurement time intervals, radiation alarms, and more. Geiger Bot can also log a great deal of data to your device's internal flash memory, and send it as an email attachment in CSV format. With log sampling resolution down to 1 second intervals, you can import this data into a spreadsheet and produce very high resolution plots of radiation data. With an iOS spreadsheet such as Numbers, you can perform detailed analysis and graphing of logged data on your device itself. 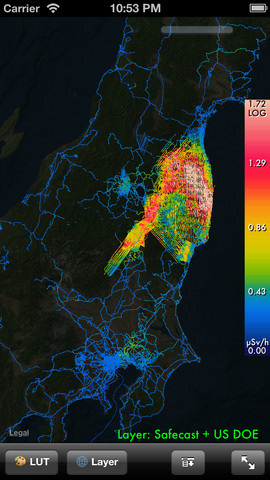 Geiger Bot features an integrated mapping module for displaying your logged data with a false-color palette to highlight intensity levels of radiation similar to a thermal camera. All of this data can be displayed simultaneously. Geiger Bot is written by Nick Dolezal of ND apps.